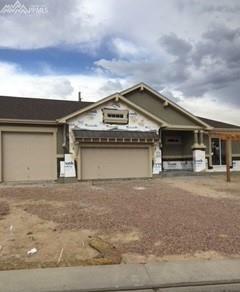 Beautiful Copperwood Ranch Plan with Main Level Master and Second Master Suite w/Separate Entry. Open Floor Plan - Great Room Has 13 Ft. Ceilings, Gas Fireplace with Stone Extended to the Ceiling. Slider Wall Opens to Extended Covered Patio. Gourmet Kitchen with Double Ovens, Gas Cook Top, Large Island with Upgraded Solid Surface Counter Top and Walk-In Pantry. Formal Dining Room, Separate Laundry Room and Owner's Entry Complete the Main Level.